Public officers are sometimes stuck with making difficult choices. Based on real case studies from the Corrupt Practices Investigation Bureau (CPIB), have a go at what you’ll do in these scenarios. 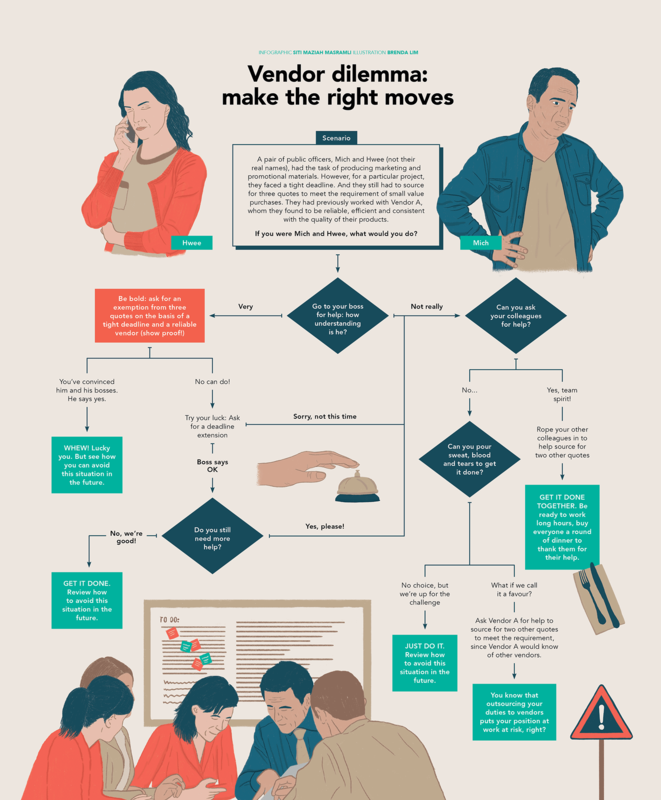 Will you make the right moves? Or end up charged in court with corruption? Out of convenience, Mich and Hwee asked Vendor A to help source for two more quotes to meet their requirement of three quotes. This unsavoury practice was eventually shared and propagated to other agency staff. To make up the three quotes, Vendor A falsified quotes under the names of two other companies. Through this arrangement, Vendor A was awarded with at least 30 contracts from Mich and Hwee’s agency. Vendor A was charged with conspiring with the agency’s employees to intentionally mislead the agency by knowingly providing falsified quotations. Vendor A was sentenced to three weeks’ imprisonment. Nine implicated public officers were also given stern warnings for their involvement as they had not personally benefited from the arrangement. Despite the public officers’ good intentions to hire a reliable vendor, they should not have taken the easy way out and circumvented sound procurement processes, which are put in place to ensure fair competition. This case serves as a good reminder to public officers to always do the right thing and carry out their duties responsibly. Stand a chance to win a prize from the CPIB. Answer this quiz and send your replies to CPIB_Event@cpib.gov.sg with your answers, name and organisation by 7 Sep 2018. One of the elements of corruption is gratification. What does gratification constitute? Money, or any gift, loan, fee, reward, commission, valuable security or other valuable property or share in any property. Any position, duties employment or contract. Any part or full payment, release from or discharge of any obligation or other liability. Any other service favour or advantage. Agree immediately as the staff appraisal period is round the corner. Agree to lend him as I am afraid to offend him. Reject him because I do not have the money. Reject and report the matter to the CPIB or police at the earliest opportunity as it may constitute a corrupt act.